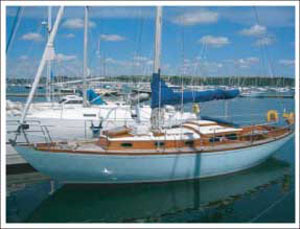 Inspired by Vashti but with with more volume, the Prior 37 is another thoroughbred from the stable of Alan Buchanan . 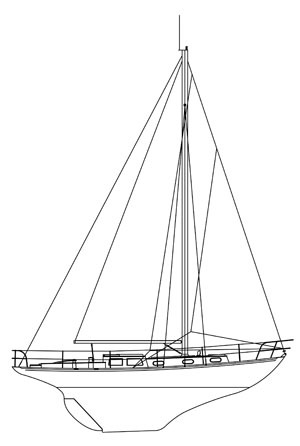 Her lines beautiful, light and graceful belie her long, deep keel which is lightened by her swept stern and fine bow. Beautifully maintained and lavished with exquisitely varnished teak superstructure, she is the pinnacle of timber yacht construction in the UK before plastic became the norm. She is so well mannered under sail that only the lightest of touch on the helm is required. 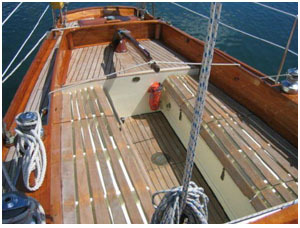 Teak deck, bronze fittings and a sumptuous long deep cockpit make her a superb cruiser/racer ready for a Channel crossing or classic yacht racing around the Island or on the Orwell. 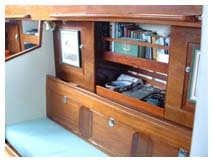 Caressa's mahogany interior is more akin to the gentleman's yachts of the Edwardian period. 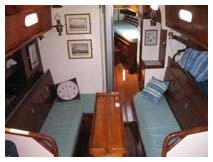 Deep book shelves, cupboards and genrous seating give a very warm and welcoming feeling in the saloon. 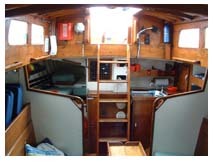 With the saloon table up and the oil lamps burning, she can seat 6 for a very cosy dinner. 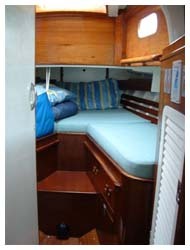 Forward are separate heads and a double bed to add to the 3 saloon berths and 1 quarter berth. 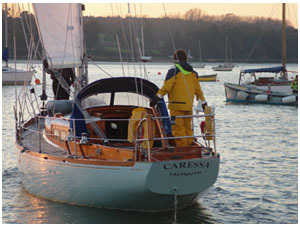 To really appreciate Caressa you need to sail her. 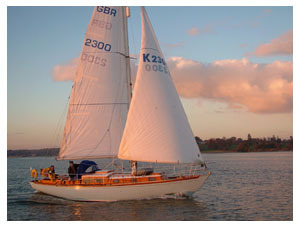 Like all timber classics, her handling is completely unique to her. The feel of the helm, the way she heels and points to the wind; not to be compared with and never mistaken for plastic boats of her size.